Jalapeno poppers without all of the work - that's exactly what this dip is! Creamy, cheesy, spicy with some crunch. Yum. I made real jalapeno poppers once before and they were great, but it took a lot of work to get them just right. Then I made Jalapeno Popper Bites and they were really easy and yummy so I thought they'd be my go-to recipe for a jalapeno popper inspired appetizer. But then I saw this dip and everything changed. Dips are my guilty pleasure and my weakness so this one didn't sit in my favorites tab long before I made it. We were having friends over for dinner several weeks ago so I immediately put this dip on the menu. It was easy to make and everyone loved it. I ate a lot of this dip. And just in case you are wondering, it does reheat well later if you happen to have any left over! Confession... I may always make extra when I'm making a hot and bubbly dip JUST so I'll have leftovers to heat up later. Or the next day. I made one major change to the recipe. Instead of using canned chilies and jalapenos, I used a mix of fresh jalapenos and freshly roasted jalapenos. I can get a bag of jalapenos at my local produce store for a lot less than 2 cans of chilies, and fresh is always better in my opinion. Finely chop 2 of the jalapenos (seeds removed). Put the other 2 jalapenos over an open flame - I use my gas stove but you can also use an outdoor grill. Roast them until the skin is completely charred, and then transfer to a paper bag or bowl covered with plastic wrap. Let sit for 10-15 minutes. Remove from the bag/bowl and peel off all of the charred skin. Finely chop the jalapenos, removing the seeds and being careful as the juices inside will be pretty hot. Mix the cream cheese, mayo, sour cream, Mexican cheese, half of the Parmesan and all of the chopped jalapenos. Spread in a baking dish. Melt the butter in a small pan. Add the panko and toss until coated. Remove from the heat and add the remaining Parmesan cheese. Pour the panko mixture over the dip and spread evenly. Bake in a 375 degree oven for 20 minutes until bubbly, turning on the broiler for the last few minutes to brown the top. 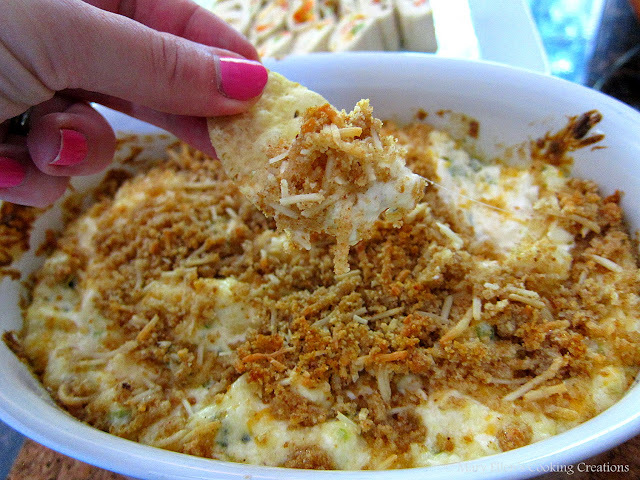 I am obsessed with all things jalapeño popper, this dip looks so good and easy!